This seems like a first, an eco-terrorist documentary. That may overstate the case, but the thriller element is there in a highly risky American operation, led by film director Louie Psihoyos, of opponents to the exploitation of dolphins for entertainment and food. They sneak up to a cove near the Japanese town of Taiji where most of the annual slaughter of 23,000 dolphins takes place and, facing the risk of arrest and torture, make secret films of the killing. Taiji is the place where the Japanese capture dolphins for training and entertainment use, usually young females. The dolphins that are not selected to be sold for up to $150,000 to perform in aquarium shows are trapped in the cove and all are killed, the remains to be sold for much less for food. The activists cosider both actions inhumane and cruel, and the second, the use of dolphins for human food, is extremely dangerous to us, because the mercury content in dolphins is lethally high and their meat is not suitable for human consumption. This film is exciting, intense, and disturbing beyond what you often encounter in a documentary. Apart from the danger to the American team of activists, there is the extreme hostility of the Japanese fishermen and those who protect their activities, not to mention the lasting sense that the ocean is lost. The Cove is as full of emotion as the killing waters are full of blood. Richard O'Barry, of the Sixties TV show "Flipper," the inspiration and instigator of this operation and one of the chief voices of the film, is the guy originally responsible for the fetishizing of dolphins as friendly, intelligent marine mammal "pets" who were deemed to "smile" and be happy in captivity, and love doing tricks like some dogs. Barry caught and trained the five "Flipper" stars and himself starred in the show. According to him one of those stars, Cathy, was so miserable in captivity that she committed suicide in his arms by voluntarily ceasing to breathe. Not right away but years later it dawned on O'Barry that what he had been doing was wrong, and instead of running a dolphin show, he set out to shut such shows down and end the capturing of dolphins. He has spent the past 35 years atoning for his dolphin sins by devoting his life to fighting the captivity and exploitation of the marine mammals he has now long believed were meant to be wild and free. He explains in detail how the noise and confinement of aquariums are torture for dolphins, whose primary means of perception is sonar. In 1986 the killing of whales was banned, but the treatment of smaller Cetaceans remained unregulated. O'Barry says dolphins are simply small whales. Japan has remained the chief killer of fish and sea mammals, he says, not so much out of necessity but in pursuit of a frustrated dream of empire. The International Whaling Commission (IWC) is a sham, dominated by Japan. The film documents meetings of the IWC and also O'Barry's attempts to infiltrate it wearing a large flat screen that plays films from the Psihoyos cove infiltration showing Japanese men massacring dolphins in Taiji. It also reviews O'Barry's story from the Sixties "Flipper" show to his present life of constant activism. At one point he's asked how many times he's been arrested and he asks, "You mean this year?" Various voices explain the international situation and the history of Japan, including the mercury poisoning tragedy of Minamata of the Fifties, which may happen again from dolphin consumption. A happy story is that the two Taiji city councilmen with kids fought the local schools' serving of (obligatory) lunches of dolphin meat and got it removed from the school menus. But where all the rest of the meat gets consumed remains somewhat a mystery, and though exposed in this film, the annual Taiji slaughter, which remains legal, still continues. Skillfully inter-cutting exposition with drama, the film builds up in the manner of a heist thriller to the undercover operation. Psihoyos and his crew, who arrive pretending to be documenting the degradation of coastal reefs, are constantly followed by undercover police and all their requests to come near the cove are denied. It becomes obvious that this superficially dolphin-loving town, full of monuments to the ocean mammals and tour boats shaped like dolphins, has a lot to hide, namely the brutal methods of killing -- even the fact that such killing happens, since interviewed Tokyo citizens are revealed to be completely unaware that dolphins are slaughtered -- or eaten. 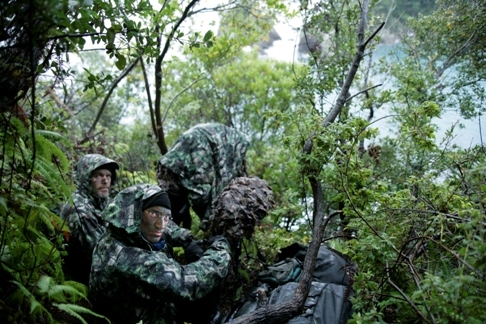 Though guerrilla filmmaking in its climactic segment, The Cove has smooth technical quality. There are detailed black and white night images; the filmmakers had heat sensor cameras that could detect the presence even of a marmot; attempts to plant secret cameras required readiness to cut and run in an instant. Otherwise, the images are anything but grainy: Psihoyos is a photographer whose work has often appeared in National Geographic, and what may have been a rough and dangerous project has emerged into one of the more powerful and polished films of the decade about the politics of environmental exploitation. This is a documentary sure to be remembered at Oscar time.